Arlington Memorial Bridge, spanning the Potomac River between the Lincoln Memorial and Arlington National Cemetery, is one of the Washington area's most beautiful bridges. What seems like such a great, even obvious, idea today was conceived in the 19th century and succumbed to the fate of so many monumental projects: delay. A traffic jam prodded it along. Before us is the broad and beautiful [Potomac] river, separating two of the original thirteen States, which a late President, a man of determined purpose and inflexible will, but patriotic heart, desired to span with arches of ever-enduring granite, symbolical of the firmly established union of the North and South. That President was General Jackson. 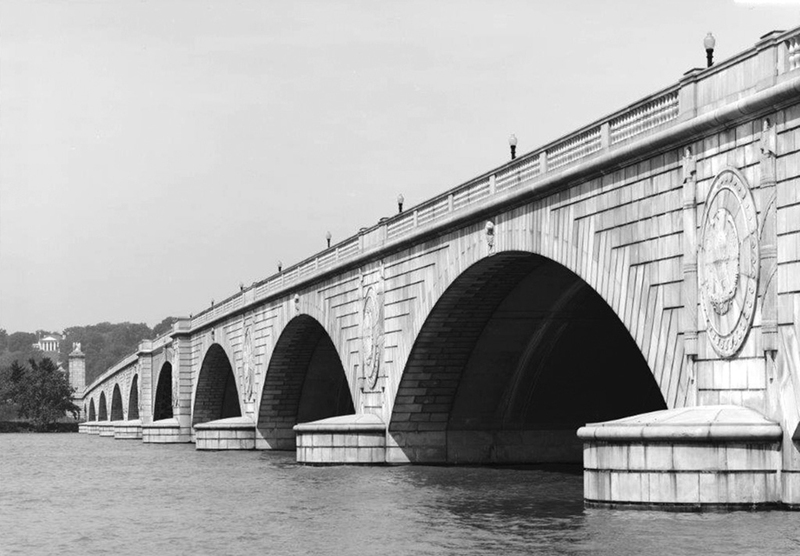 President Jackson may have been referring to replacing the Long Bridge in the 14th Street corridor, but he usually gets credit for conceiving Arlington Memorial Bridge anyway. The competition attracted a dramatic series of colossally monumental designs all of which ran from the base of Observatory Hill near the foot of New York Avenue across the Potomac to Arlington Cemetery. Congress was not interested in the grandiose plans. At the time, New York Avenue ended near the river. In 1901, Senator James McMillan of Michigan, Chairman of the Senate District Committee, headed a commission to improve the city's parks. The McMillan Commission's 1902 report included a proposal to shift the District end of the long-proposed Memorial Bridge to the site of a Lincoln Memorial, its nature not yet defined, rather than farther north as in earlier proposals. After authorizing the Lincoln Memorial in 1911 (it opened in 1922), Congress approved the Public Buildings Act, signed by President William Howard Taft on March 4, 1913, his last day in office. The Act authorized $25,000 for a commission, headed by the President, to investigate how to link Arlington National Cemetery across the Potomac River to Washington. As anyone in Washington knows, appointing a commission is often a recipe for delay. In this case, Congress accomplished the delay by authorizing the funds for the commission, but neglecting to appropriate the funds so they could be used. The commission was, therefore, delayed. It was not to be a glorification of the Confederacy, but a work for the unification and development of the United States of today and tomorrow, and as such it began the movement which is spreading to be part of the plan to link together the names of Lincoln and Lee. As a southern counterpart to the Lincoln Highway, the highway might logically have been named after the president of the Confederacy - but that name was taken. In 1913, the United Daughters of the Confederacy launched the Jefferson Davis Memorial Highway from Washington to California - and eventually to the Canadian border at the Peace Arch in Blaine, Washington. Dr. Johnson wanted a grand entrance for Lee Highway into the Nation's capital. In 1920, he conferred with Chairman Charles Moore of the District's Commission of Fine Arts. They agreed to work together to secure funding for a bridge on a line connecting the Lincoln Memorial with the Custis-Lee Mansion (now called Arlington House), home of the Lee family before the Civil War, in Arlington National Cemetery. In June 1920, Congress finally appropriated the $25,000 authorized in 1913 to establish the Arlington Memorial Bridge Commission. The slow work began. The delay might have lasted until today if not for a monumental traffic jam on November 11, 1921. President Warren G. Harding, who had taken office on March 4, was on his way to Arlington National Cemetery for the dedication of the Tomb of the Unknown Soldier. His automobile became trapped in what the Associated Presscalled "the worst traffic jam the National Capital has seen in many years." The jam, apparently started when a small touring car ran out of gas on the Highway Bridge (successor to the Long Bridge), kept thousands from reaching the ceremony. The President's car left the White House on schedule . . . . When the machine, preceded by secret service men and policemen mounted on motor cycles [sic], reached the outskirts of the jam, it left the road three times and cut across the grass [of Potomac Park], reaching points ahead where the road was comparatively clear. At times, the secret service men in the car got out and walked ahead, clearing space for the White House car [getting it across the Highway Bridge]. When the presidential party reached the [Agriculture Department's] Arlington experiment station, the car was driven off the roadway and through the lanes which cut through the farm. As reporter Jack Eisen of The Washington Post wrote in a 1958 look back, the terrible traffic jam that left the town "tied in knots," illustrated the urgent need for the bridge. "That did it," he wrote. "The push was on." On December 18, 1922, President Harding and Vice President Calvin Coolidge met with other commission members. After a brief discussion, they took White House automobiles to the alternatives that the President wanted to see for himself. First, they went to the terminus of New York Avenue, site of a Naval hospital. After discussing the bridge proposed for this location, the commission moved to examine the Lincoln Memorial alternative. After a stop at the site, the commission was driven to the Highway Bridge, crossed the river, and went to Arlington National Cemetery. Standing on a high mound north of the cemetery, the commission members could examine both sites. President Harding expressed his preference for the Lincoln Memorial site as the best alternative for residents and tourists visiting the two shrines. The most striking incident of the whole trip came when President Harding crossed the Georgetown Bridge afoot, hopping over the rough stones and plunging through the mud to the more completed north end of the bridge . . . The wind was then blowing severely on the bridge, but the President seemed to enjoy it, striding along . . . at a brisk pace. From design to completion took another decade, spanning the death of President Harding on August 2, 1923, the administration of President Calvin Coolidge, the election of former Secretary of Commerce Herbert Hoover as President, and the start of the Depression. Arriving at the bascule draw span, which was drawn apart, the party left the automobiles. A battery of cameramen took countless photographs of the party and then, to the tune of shrieking sirens that are part of the bascule draw span equipment, the two great leaves of the mid-bridge were lowered. President Hoover and his party walked at a rapid rate for the rest of the length of the bridge, almost to Columbia Island. 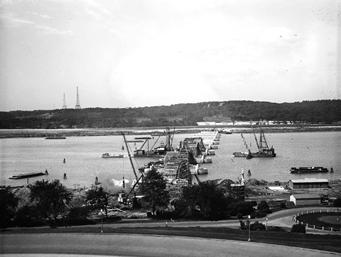 With the eye of an experienced engineer, the President surveyed the bridge project over which he had been many times before, and noted the spacious boulevard that keeps company with the Potomac River for many miles, until it terminates at the old home of George Washington. Two engineers of note accompanied the Chief Executive and Mrs. Hooverâ€”Lieut. Col. U.S. Grant, 3d, executive officer of the Arlington Memorial Bridge Commission, and Thomas H. MacDonald, chief of the Bureau of Public Roads of the Department of Agriculture, under whose jurisdiction the highway has been built. The presidential party then took to their automobiles again, after glancing at the quartet of giant eagles that sit atop the great pylons looking down upon the future Great Circle that is planned for Columbia Island. The file of automobiles then turned to the left and moved on to the Mount Vernon Memorial Highway on the island, passing then under the highway and railroad bridges and on down to Alexandria in a thin cloud of dust. At Mount Vernon, President Hoover and his fellow commissioners posed again for photographs with the historic estate in the background. The party glanced at the parking spaces that will accommodate numerous automobiles and saw the landscaping plans for the terminus of the magnificent highway. The bridge, built by the U.S. Army Corps of Engineers at a cost of $6,650,000, did not have lighting for nighttime traffic. Officials had not agreed on "the final design of illumination, in keeping with the dignity of the project." The Commission of Fine Arts would determine the design for additions to the bridge. The final touches were not completed until September 1933. The Mount Vernon Memorial Highway, which BPR built at a cost of $6.2 million, also was not ready for traffic. After BPR installed lighting, the highway opened to all-day traffic on May 3. Officials formally dedicated the highway on November 15, 1932, during a ceremony held just outside Mount Vernon's gates. Pulling aside the American flag covering a bronze plaque mounted on a boulder at the circle-terminus just outside the grounds, Senator Simeon D. Fess of Ohio, a member of the Washington bicentennial commission, called the highway a "fulfillment of a yearning of the people" for better access to Washington's home. "It was appropriate that a great boulevard skirting a new right-of-way along the river, free from the inconvenience of commercial interruptions, devoted wholly to the purpose of a visit to this hallowed spot, should be constructed as a permanent memorial of the Bicentennial year." Nine-year-old Alice Burnside Dorsey sprinkled soil gathered by her mother from sites associated with Washington, such as Valley Forge, in front of the plaque. Considered by many Washington's most beautiful bridge, its structure is relatively simple: eight neoclassical arches. The monumentality derives from all the extras, including eight-foot-bas-relief eagles atop 35-foot pylons, eight-foot bison (by Paul C. Jennewein), a pair of gold figures (by Leo Friedlander), and the elegant white stone (North Carolina granite). One curious note: It has a draw span, a rarely used 216-foot marvel of American engineering that was designed by Joseph B. Strauss, who later engineered the Golden Gate Bridge. The city's most beautiful bridge, first proposed (possibly) by President Jackson in the 1830s, was made possible, at least in part, by a moment in time when the President of the United States (and everyone else) became stuck in traffic.